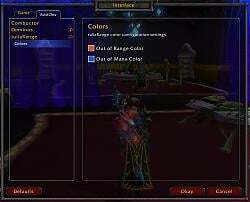 tullaRange is an addon that's main purpose is to make standard action buttons appear red when out of range. 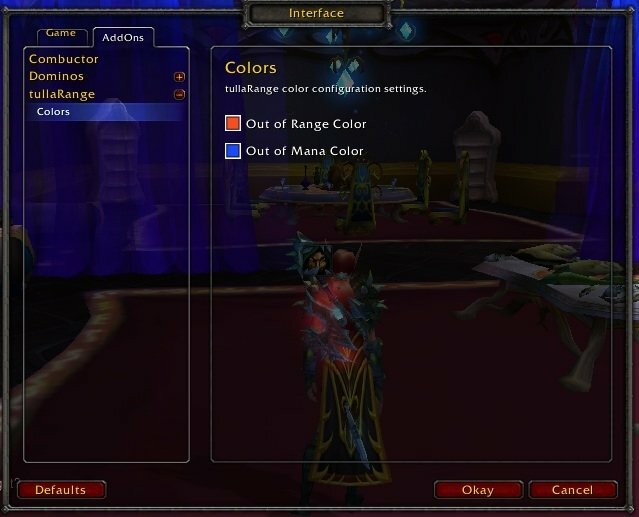 Colors for both the out of range indicator, and the out of mana/energy/rage indicator are customizable via the in game GUI. * Switched to using an OnUpdate handler again, with the hopes of fixing the random crash that happens. * Adjusted config to pick random icons from your spell book, instead of attempting to pick a random icon from your action bars. * Updated for WoW 6.0. * Switched over to using the new C_Timer API. * Redesigned the options menu. * Fixed a typo in the options menu that was causing errors. * Out of range coloring bugfix. * Added a configuration interface. * Fixed an error with flashing buttons. So, the client crash is related to calling C_Timer very often? I appreciate the thorough explanation, but I am particularly interested in what is causing the client to crash. You'd think that Blizzard would implement some sort of throttling C side if a flood of calls was fatal enough to crash the client. It appears that your C_Timer implementation in this AddOn was indeed the source of a client crash (one that I was experiencing as well). Have you got any insight as to why such was the case with tullaRange, and not the case with tullaCooldownCount? I know you did some tinkering with tullaCC as well; any explanations would be helpful. Thank you. In most cases, initiating a second C_Timer is still going to be cheaper than using an Animation or OnUpdate. The issue here is that both Animation and OnUpdate calls have overhead that applies every frame while they are active. For OnUpdate, the overhead lies in the extra function call to Lua. For Animations, we’re doing work C-side that allows us to support smoothing, parallel animations, and animation propagation. In contrast, the new C_Timer system uses a standard heap implementation. It’s only doing work when the timer is created or destroyed (and even then, that work is fairly minimal). The one case where you’re better off not using the new C_Timer system is when you have a ticker with a very short period – something that’s going to fire every couple frames. For example, you have a ticker you want to fire every 0.05 seconds; you’re going to be best served by using an OnUpdate function (where about half the function calls will do something useful and half will just decrement the timer). I switched out to using an OnUpdate timer because people were reporting crashes with tullaRange with the C_Timer implementation, and also because of the recommendation that C_Timer calls not be used on things that update relatively frequently (tullaRange does every 0.15s when active). As you say, it seems to have resolved crashes that were seemingly caused by the addon. The change I made to tullaCC was to give any C_Timer.After call a minimum duration, 0.01s, just in case the C_Timer API had any weirdness with timers shorter than that. I've not tested that theory, though. Tried that and still no color =( Dang expansions. some problems. nMainbar has its own out of range coloring. Without an error message, I don't know what the issue would be. So I use nMainbar - normal bar it works, however when I load nMainbar, the range colors no longer work. Some sort of coding mix up? Hopefully something that I can change myself to allow it to work with the bar mod. The interface (change color, etc), works, however, nothing on the bars =( and no errors pop up at any time. Last edited by aspenzs : 10-16-14 at 09:03 PM. Last edited by aspenzs : 10-16-14 at 08:59 PM. The out-of-range coloring doesn't seem to go away when you stop targetting an enemy that is far away. The red color goes away if you mouse over the action buttons but stays till that or a new target that's on range. I've not reproduced this one, but I've only tried on friendly targets. Do you experience the same on those? 1. Target an out-of-range enemy unit (f.e. a training dummy). 2. Press ESC to lose target. 3. The red color stays on the buttons even though you have no target. 4. Mouse over the buttons to lose the red color. (Selecting a new target works to fix, too). Last edited by Hopelez : 10-16-14 at 05:54 AM. I don't think there's any reason you can't just update the TOC and have it work in WoD. I'll be working on an update and switching stuff over to the new C.Timer API. thank you for responding, i figured that was all that was necessary and was surprised to find it didn't work with the toc change.